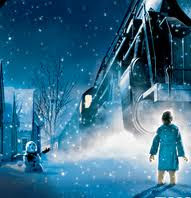 The 2004 animated film "The Polar Express" used a new method of animation called "Performance Capture". The actor wears a skin tight costume with points on it that can be recorded by a computer. Then, his performance is filmed by 72 to 100 different cameras. This method allows the animator to develop very life-like movements and images, manipulate the image in three dimensions, and choose any point of view. "Performance Capture" gives the animator many more choices than traditional animation. 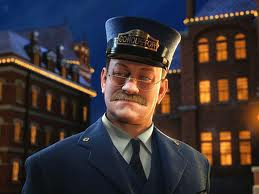 Robert Zemeckis, the director of "The Polar Express" wanted the film to be more realistically alive than the usual animated feature. He turned to Ken Ralston, the visual effects supervisor at Sony Picture Imageworks. Ralston proposed taking the technology of Performance Capture to a new level. The result was amazing. The smallest facial expressions of the actors were recorded and expressed in the action. The excellent actor Tom Hanks plays six different roles in "The Polar Express." Chris Van Allsburg wrote the children's book on which the movie was based. Chris Van Allsburg was born in 1949. He studied in art school to become a sculptor, but when his wife saw the drawings he did for sculptures, she decided they would make very good illustrations for children's books. So, Van Allsburg wrote 15 different children's books and won several awards for them. Another of his books, "Jumanji" was made into a very successful movie starring Robin Williams. Van Allsburg's books are important for children because they show the dark side of life that many children's books are careful to avoid. In "Jumanji", suburban children are playing a board game with animal tokens. However, one wrong move in the game, and real wild animals appear in this quiet suburb such as monkeys, lions, and elephants. The story of "The Polar Express" is about a 12 year old boy living in Grand Rapids, Michigan, who no longer believes in the mythic gift-giver, Santa Claus. Before he goes to sleep, he sees his parents preparing presents. This proves that there is no Santa. Nobody climbs down the chimney or rides reindeer in the night. Parents everywhere are telling children a story that isn't true. The real presents come from one's parents, and no one else. The boy checks his suspicions by looking up "Santa Claus" and "The North Pole" in an encyclopedia. There is no mention of a North Pole or a Santa Claus. So the story told to children by their parents cannot be true. As the boy is about to fall asleep, he hears a huge sound outside. It sounds like a rumbling metallic giant, and objects shake in his room. He looks through the window and he's very surprised to see a train. How can that be? There are no train tracks running by his house. The train stops in front of his house. The boy throws on a bathrobe and goes outside because he is curious about what this means. A mysterious train conductor stands on the snow before the entrance to one of the train cars. The train conductor invites the boy to get on board and travel to the North Pole to see Santa Claus and his helpers, the elves. But the boy shakes his head. He must be dreaming. There is no Santa. There is no North Pole. He thinks this is too weird and might possibly even be dangerous. So, the train starts to leave. Suddenly, the boy's curiosity. becomes too much. He catches up to the train and climbs on. On the train, the boy meets other children his age. He meets a young girl who is very nice and friendly, and he meets a boy who seems to know a lot of facts, but not much else. The word for this kind of person is "know-it-all". The train makes one more stop. It pulls next to a very shabby house at the edge of the town. There stands a poor boy who is frightened and shy. His name is Billy. He also at first refuses to board the train. The conductor says, "Suit yourself", and the train pulls away. Then Billy changes his mind and catches up to the train just like the first boy. The train ride seems as though it is going to be a lot of fun. Several very entertaining dancing and singing waiters serve delicious hot chocolate to the children. The conductor of the train is both kind to the children and very strict about the rules for travelers. One important rule is that everyone must have a ticket, and every ticket must be punched. The young girl loses her ticket, and the boy desperately tries to find it. When he finally finds the young girl's ticket, he must locate the conductor and the young girl who have disappeared. He is afraid the conductor will throw the young girl off the train. In a very strange scene, the boy ends up on top of the train where he meets a hobo. The hobo tries to help the boy find the girl and the conductor. But the hobo, it turns out, is really a ghost. The boy finally finds the girl and the conductor, and the conductor punches the girl's ticket. The train goes through a pine forest, and we see a pack of wolves but no humans, no houses or towns. Already the train is moving through the wilderness of the far North. The train goes at a rapid rate down very steep hills. At one point, the train gets into serious trouble. The tracks are lost under water that has frozen. The train engineers, Smokey and Steamer, are having a very difficult time re-connecting the train to the tracks. They finally succeed, but the train comes very close to sinking through the ice. The train finally arrives at the North Pole. It is a beautiful city devoted to Santa's Christmas present industry. 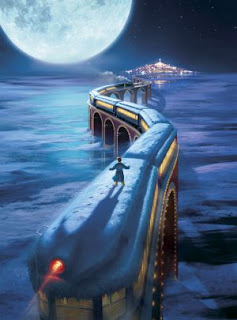 All of the residents of the city, the elves, are very excited because at midnight exactly, Santa Claus himself will appear and give the first Christmas present to some lucky passenger from The Polar Express. Who will it be? The children are on their way to the main square where this important event will be held. But Billy, the sad poor child doesn't want to go. He is from a broken home, and Christmas has never been a happy time for him. The boy and young girl go back to the train to try to convince Billy to join them. But accidentally, the train car loses its connection with the main train and begins rolling down hill. Now the children are in a car that is out of control. When the train car stops, the three children are completely lost. After wandering through the maze of the city and having a number of adventures, the children finally reach the town square just in time. Santa Claus appears to great cheering and applause. Suddenly, all the action stops and the scene becomes silent. A bell has fallen off Santa's sleigh and rolls toward the boy. The boy picks up the bell. Will it really ring or not? He closes his eyes and says, "I believe. I believe". Then, he shakes the bell and it rings. Santa looks on and nods his head as if to say "I know what you are thinking." Santa chooses to give the boy the first gift of Christmas. The boy could have anything he wants, but he chooses the bell that he had just found in the snow and that had rung for him. Santa Claus gives the boy the bell as the first gift of Christmas, the bell that only rings for believers in Santa and the spirit of Christmas. 1. "The Polar Express" is based on a children's book written by ______________________ . 2. The boy proves there is no Santa Claus because ____________________ . 3. After the young girl loses her ticket, _______________________ . 4. The first gift of Christmas is a _____________________________ . 5. At one point in the journey, the train is almost lost because ______________ . 6. The new animation technique called "Performance Capture" ____________. 7. The director of "The Polar Express", Robert Zemeckis turned to ________________ who took Performance Capture to a new level. 8. The boy and his friend the young girl didn't go to the main square right away because they were concerned about _________________________ . 9. Chris Van Allsburg, the writer of the children's book on which the film was based was trained as a ________________________ . 10. Chris Van Allsburg's award winning children's books are different from most other children's books because he tries to show ______________________ .